Barrel Distortion in a lens curves straight lines, typically at the widest angle focal lengths. 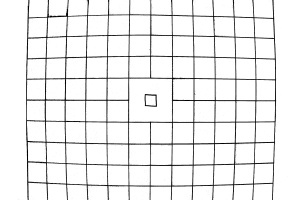 The grid that you see in the digital photo to the right is composed of perfectly straight lines. The photo was taken with a 18-70mm lens in the 18mm position. Barrel Distortion is obvious in the test grid that you see to the right, but rarely noticed in the digital photos that we all take, unless some straight edge is near the edge of a photo -- like the edge of a building, or the top of a roof line. Most zoom lenses experience some minor barrel distortion in the widest field of view.